Jonathan Gold, Pulitzer Prize-winning food critic of the Los Angeles Times, has a new article now available in which he discusses ways for food enthusiasts to enjoy the finest foods available without breaking their budgets in the process. 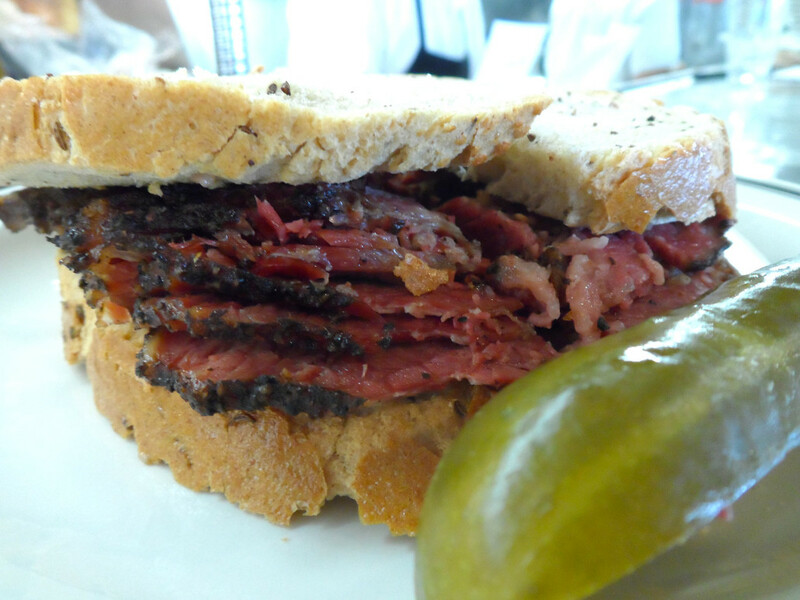 Everyone knows that Langer’s serves the best pastrami sandwich in Los Angeles. Still, if you haven’t been to Langer’s in a few years, you might be surprised to see the long lines outside the delicatessen on a Saturday afternoon, supplicants waiting for their shot at the No. 19, a baroque concoction of hand-cut pastrami, Swiss cheese, coleslaw and Russian dressing on double-baked rye bread. https://www.langersdeli.com/wp-content/uploads/2014/09/langers-090214.jpg 1350 1800 Langer's Deli https://www.langersdeli.com/wp-content/uploads/2013/04/langers-0914-logo.png Langer's Deli2014-09-04 09:23:042014-09-04 09:23:04LA Times: Jonathan Gold's "The Finest Food in Los Angeles for even the Thinnest Wallets"
Our Corned Beef & Cabbage Dinner made Eater.com’s new 10 Great Retro Meat Dishes list, recently published at their website. Go check out all the listings – we’re in delicious company! 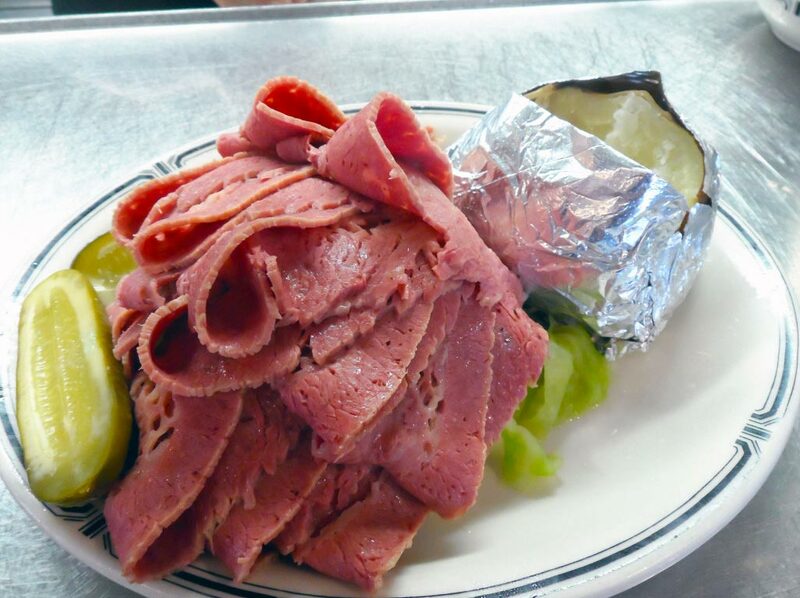 Yes, you do need to order the #19 pastrami sandwich, which also could merit a spot on this list. However, the good old fashioned corned beef and cabbage is a true classic that brings back childhood memories for many baby boomers. Corned beef and cabbage – not just for St. Patrick’s Day! 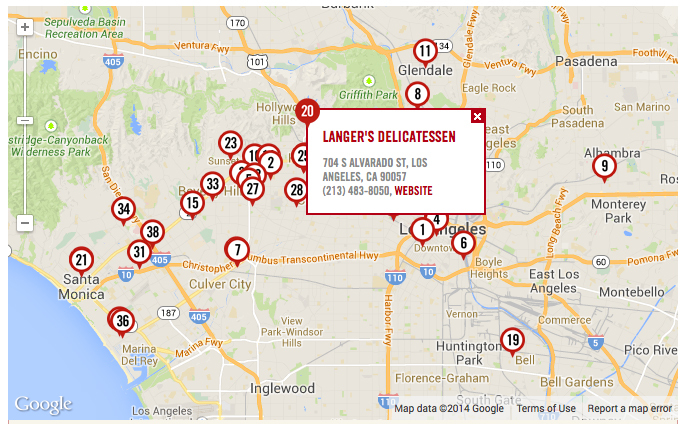 Langer’s Delicatessen-Restaurant is proud to have once again been named to Eater.com’s 38 Essential Los Angeles Restaurants list. It’s an incredible honor sharing recognition with some of the most amazing restaurants and dining establishments in the Southland. Click here to view the complete list of 38. New Yorker foodies, were, of course outraged. Subsequently, everyone from Pulitzer Prize winning food critic Jonathan Gold to the James Beard Foundation have weighed in favor of Langer’s. Native New Yorker Nora Ephron, who went on record in the pages of The New Yorker that Langer’s serves the best pastrami in America, finally did a side-by-side taste-off between Langer’s and Katz’s, the iconic New York deli to quiet East Coast sore losers. Langer’s handily won the re-match. Click here to read the entire article – it’s worth a click. Thank you, Max! All of us at Langer’s Delicatessen-Restaurant are thrilled that Food Network’s Sandwich King Jeff Mauro has named our pastrami on rye as his #1 sandwich in the entire United States in a recent Yahoo Travel article. This is my benchmark for all great sandwiches. 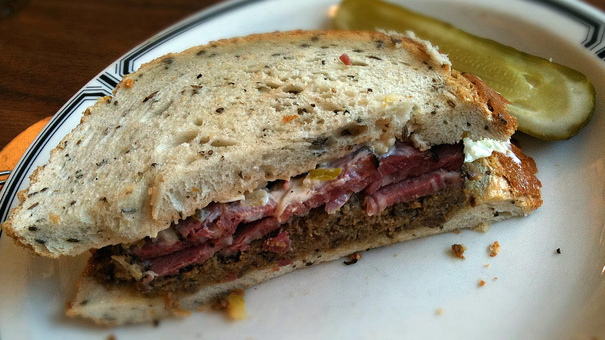 The country’s best house-made pastrami combined with the country’s best rye bread. Order it hand-cut with a schmear of some deli mustard, and leave it be. With a side of extra-crispy fries and three ice teas, this is my favorite meal in the world. It’s simplicity at its finest, and in a world of over-stuffed, over-complicated sandwiches, Langer’s keeps it real with nothing but craftsmanship, history, and a dab of mustard. Click here to read his complete roundup of American favorites – and thank you, Jeff! Hope to see you soon! It’s that time again – voting for your favorite sandwich in Los Angeles. And this time it’s brought to us by the Los Angeles Downtown News, whose “Best of Downtown Reader’s Choice” for 2014 has just kicked off. We would greatly appreciate your taking a few moments to register and vote for us. Plus, if you vote in 30 or more categories – yes, it’s a big, BIG contest with lots of categories – you may be eligible to win a prize from the Downtown News. So click here and scroll down to the no. 16 category, “Best Sandwich / Wrap” – and click on Langer’s Delicatessen-Restaurant. All of us at Langer’s appreciate your support. 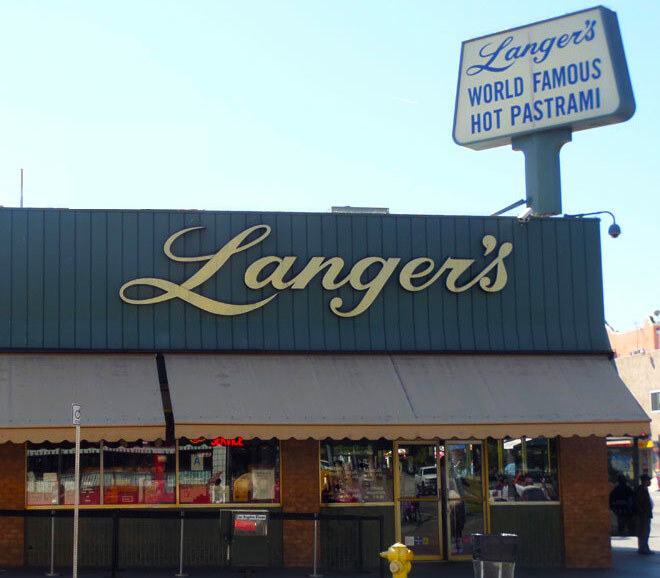 The reason Langer’s has made it all these years, is its delicious deli food, which is not easy to come by in Los Angeles. In my honest opinion, I think their Pastrami sandwich is the best I have ever had and I grew up on Deli food. 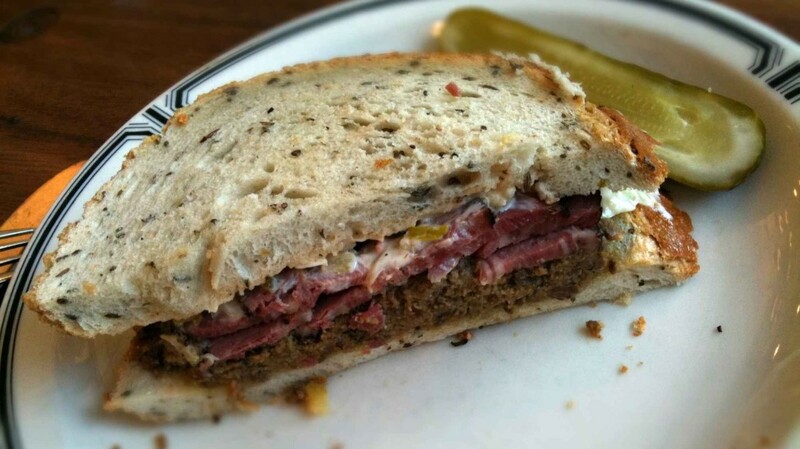 The Pastrami is very tender and their twice baked rye bread is crunchy on the crust and soft as can be on the bread. If you are not a purist (pastrami and deli mustard), they have a fantastic Pastrami sandwich (#19) with Cole Slaw, Swiss cheese and Russian style dressing. Add in a side of Potato Pancakes and a Cream Soda and you are set. Langer’s menu offers up a large variety of traditional Delicatessen fare, so everyone in the family should find something to their liking. The deli is known best for its #19 sandwich made with hot pastrami, cole slaw, a slice of Swiss cheese, and Russian dressing on hot rye bread. What makes the rye bread so special is the process of double-baking. The bread is received from the bakery, and then re-baked at 350 degrees for 30 minutes to give it a crispy crust. It also has its own take on matzoh ball soup which includes chicken, noodles, matzoh balls and vegetables served in a warm pot. Click here to view the original article, and click here to view the slideshow which includes Langer’s Deli. Our thanks to TheDailyMeal.com for including us – The Langers. Okay people, this is the real deal. Langer’s is the deli that makes America proud. It may be a throwback to an old diner from the 80s, but the food makes up for it. After downing the best ever pastrami sandwich, some biscuits and gravy, warm apple pie soaked in a savory brandy sauce and maybe some coffee to top it off, you’ll need a 7-hour nap. Check out all the listings on this great article by clicking here. Thank you, Movoto! …the #19, a pastrami and coleslaw monster that’s not just one of the best sandwiches in the city — it’s been called one of the best in the country, too. Sign up today for the Langer's Newsletter. Published a few times annually, the newsletter contains updates about the restaurant, fun facts, offers, and more. It's absolutely free, your privacy is assured, and you can unsubscribe at any time. Langer's Delicatessen-Restaurant is the proud recipient of the coveted James Beard Foundation Award. Click here to learn more about this prestigious honor.